In neuroimaging, brain tissue segmentation is a fundamental part of the techniques that seek to automate the detection of pathologies, the quantification of tissues or the evaluation of the progress of a treatment. Because of its wide availability, lower cost than other imaging techniques, fast execution and proven efficacy, Non-contrast Cerebral Computerized Tomography (NCCT) is the most used technique in emergency room for neuroradiology examination, however, most research on brain segmentation focuses on MRI due to the inherent difficulty of brain tissue segmentation in NCCT. In this work, three brain tissues were characterized: white matter, gray matter and cerebrospinal fluid in NCCT images. Feature extraction of these structures was made based on the radiological attenuation index denoted by the Hounsfield Units using fuzzy logic techniques. We evaluated the classification of each tissue in NCCT images and quantified the feature extraction technique in images from real tissues with a sensitivity of 92% and a specificity of 96% for images from cases with slice thickness of 1 mm, and 96% and 98% respectively for those of 1.5 mm, demonstrating the ability of the method as feature extractor of brain tissues. GORDILLO-CASTILLO, N. et al. 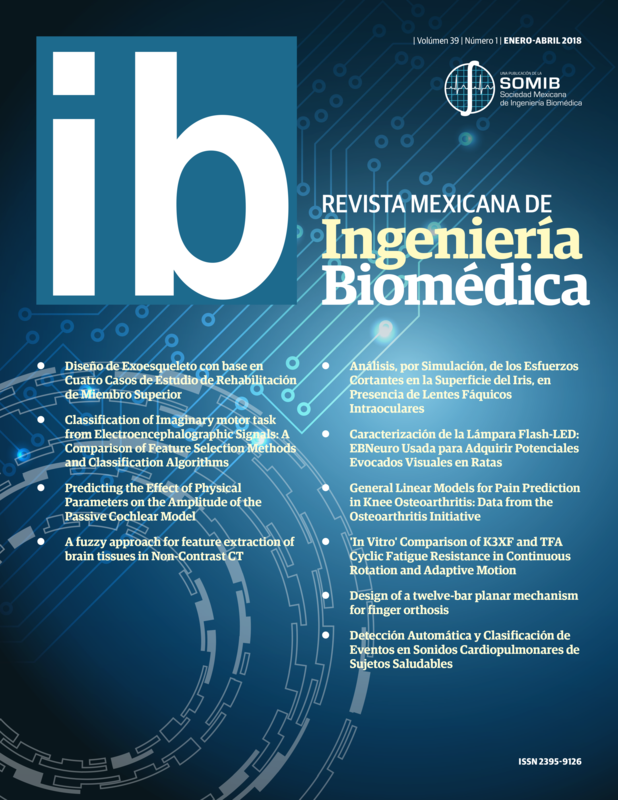 A fuzzy approach for feature extraction of brain tissues in Non-Contrast CT. Revista Mexicana de Ingeniería Biomédica, [S.l. ], v. 39, n. 1, p. 113-121, ene. 2018. ISSN 2395-9126. Disponible en: <http://rmib.mx/index.php/rmib/article/view/378>. Fecha de acceso: 26 abr. 2019 doi: https://doi.org/10.17488/RMIB.39.1.10.